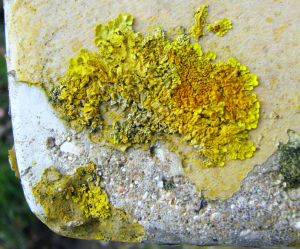 Observation - Yellow foliose lichen - UK and Ireland. Description: A bright yellow lichen growing on an old hydrant marker on the side of the path. A bright yellow lichen growing on an old hydrant marker on the side of the path.